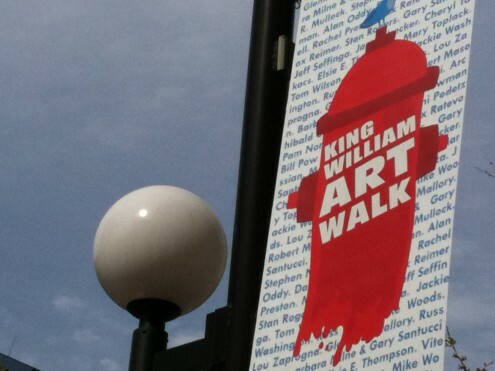 Right around the corner from our office, the King William ARTWALK is about to become a reality. From the ARTWALK’s website: “The mission of King William ARTWALK is to foster, create and maintain through partnerships a designated urban art trail by connecting arts and cultural activity centres in the downtown core. The trail will create an animated pedestrian environment which will encourage increased exposure to a variety of artistic and cultural experiences. In addition, it will contribute to economic renewal through increased tourism and investment.” Cool! I love their logo, too which was created by local everywhere guy, Matt Jelly. A twitter-like bird on a fire hydrant. Yeah, that’s Hamilton ready to take on the new world. I completely agree with their vision statement: “art can be everywhere in urban environments, not just in concert halls, theatres, galleries and museums but literally, right on the street.” I can’t wait for our neighbourhood to be transformed into a living art gallery. Good on ya, Arts Hamilton.